This exhibit displays vintage postcards of views, scenes, and businesses along historic U. S. Highway 66 through Arizona. 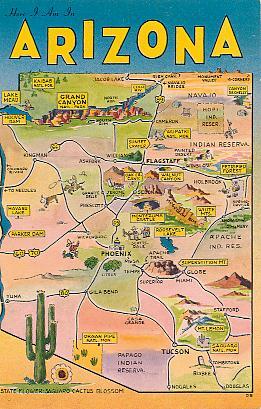 They are regular size (3 1/2 x 5 1/2 inches) postcards published from the late 1920s to the 1960s. They are displayed in travel order going west from the New Mexico border to the California border. The postcards show scenes that were seen by travelers from right along the highway unless otherwise noted. The exhibit shows the variety of postcards available to travelers. The age estimates for the unused postcards are based mainly on automobiles in the views and on publishers and postcard style. However, some estimates may be off by half a decade or so. The actual text printed on the postcards is in quotation marks. My comments are in brackets. 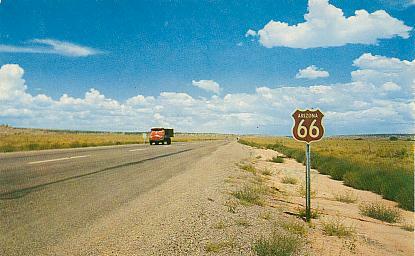 U. S. Highway 66 is the quintessential historic federally numbered highway. 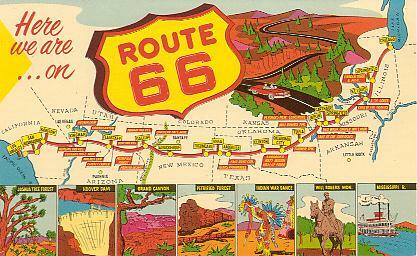 The numerous "roadies" with a passion for "Route 66" affectionately refer to it as the "Mother Road". It was one of the original Federal Highways commissioned in 1926 along with some of its other famous newly numbered cousins such as U. S. 30 - "The Lincoln Highway", U. S. 40 - "The National Highway", and U. S. 80 - "The Broadway of America". 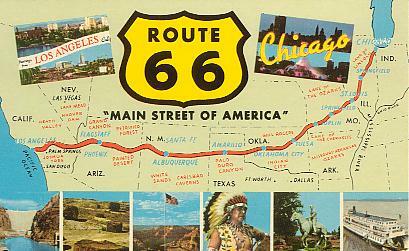 Route 66 was not a true coast to coast transcontinental highway. Its eastern end was in downtown Chicago, Illinois. Its western terminus was in Santa Monica, California. From Illinois, it ran southwest and then mostly directly west through Missouri, Kansas, Oklahoma, Texas, New Mexico, and Arizona. The construction of the modern Interstate Highways starting in 1956 which paralleled the "Mother Road" (as I-40 and I-44) initiated the eventual demise of the old highway -- in 1985 it was completely decommissioned. Today, most of the states it traversed have signed it as "State Highway 66" or "Historic U. S. Highway 66"..
U. S. 66 has been given several nicknames over the years: "The Main Street of America" and "The Will Rogers Highway". "Here we are on Route 66 - "Main Street of America"". Color chrome-style printed postcard. Published by H. S. Crocker Co., San Francisco, Calif. Number HSC-320. Unused. Circa late 1950s. "Route 66 - "Main Street of America"". Color chrome-style printed postcard. Published by Curteich. Number 4DK-1632. Number CK.446. Unused. 1964. 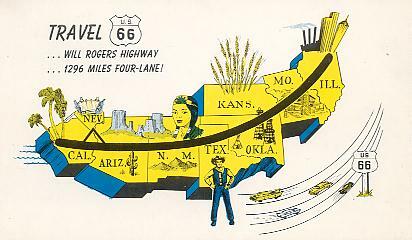 "Travel U.S. 66...Will Rogers Highway...1296 miles four-lane!". Color chrome-style printed postcard. Published by U. S. 66 National Highway Association, Clinton, Okla. Printed by Russell Stationery Company, Amarillo, Texas. Unused. Circa 1950s. 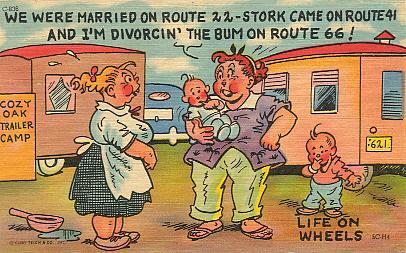 [Some Route 66 humor]: "We were married on Route 22, stork came on Route 41, and I'm divorcin' the bum on Route 66! ...". Color linen-texture printed postcard. Published by Curteich, Chicago. Number 5C-H4. Number C836. Unused. 1955. 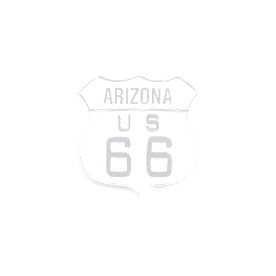 Route 66 was the important and major east-west highway for northern Arizona. Coming from New Mexico, U. S. Highway 66 crossed into Arizona at the small community of Lupton. From there, it ran fairly directly west through the towns of Holbrook, Winslow, Flagstaff, Williams, Ash Fork and Seligman. From the small village of Peach Springs, the highway turned and headed southwest through Kingman and Oatman to the Colorado River where it crossed into California at the small community of Topock. Today, probably over 80% of the original two-land Highway 66 is still driveable, the rest of it having been covered by modern Interstate 40. 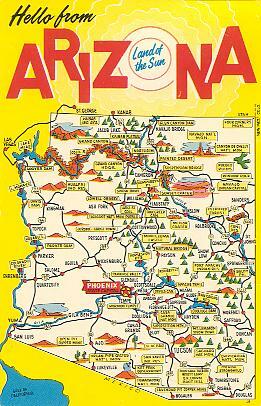 Here is a scan of the northern portion of the Arizona map in the 1938 edition of the California - Nevada - Arizona Road Map (published by General Petroleum Corporation and prepared by Rand McNally & Company (#T.3627)) showing U. S. Highway 66. 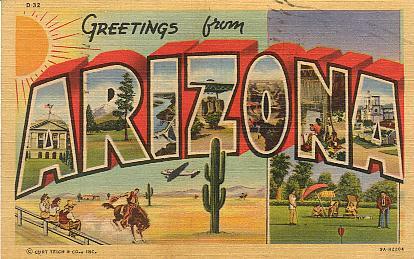 "Greetings from Arizona...". Color linen-texture printed postcard. Published by Lollesgard Specialty Co., Tucson, Arizona. Printed by Curteich, Chicago.. Number 4B-H671. Number A-3. Unused. 1944. [The view in "R" is probably from along U. S. 66]. "Greetings from Arizona". Color linen-texture printed postcard. Published by Tucson News Co., Tucson. Number 49392. Number M126:-. Unused. Circa 1940s. 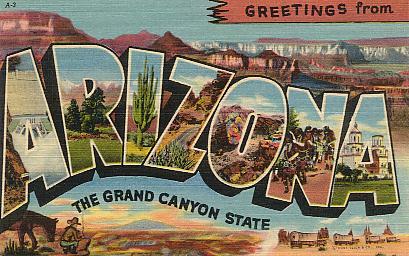 "Greetings from Arizona...". Color linen-texture printed postcard. Published by Lollesgard Specialty Co., Tucson, Arizona. Printed by Curteich, Chicago.. Number 9A-H2204. Number D-32. Published 1939. Postmarked 1942. [The view in "R" is probably from along U. S. 66]. 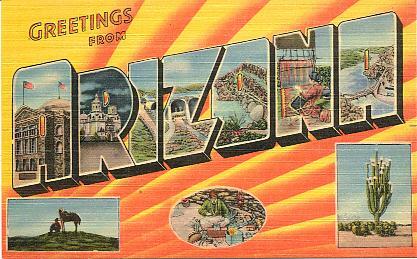 "Greetings from Arizona". Color chrome-style printed postcard. Published by Colourpicture, Boston, Mass. Number P13879. Unused. Circa late 1950s. [Map shows U. S. 66]. 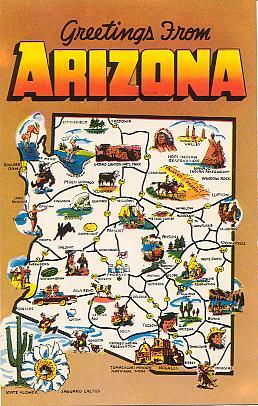 "Here I am in Arizona". Color chrome-style printed postcard. Published by H. S. Crocker Co., San Francisco, Calif. Number HSC-219. Unused. Circa early 1960s. [Here is another map showing U. S. 66]. "Hello from Arizona...". Color chrome-style printed postcard. Published by H. S. Crocker Co., San Francisco, Calif. Number HSC-219. Postmarked 1966. [Here is another map showing U. S. 66]. "Famous Route 66 through northern Arizona...". Color chrome-style printed postcard. Published by Petley Studios, Phoenix, Arizona. Number 10075. Number K448. Unused. Circa early 1960s. 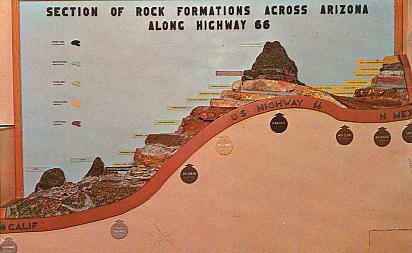 "Section of rock formations across Arizona along Highway 66". Color chrome-style printed postcard. Published by Petley Studios, Phoenix, Arizona. Number 90922. Published circa late 1960s. Postmarked 1982.